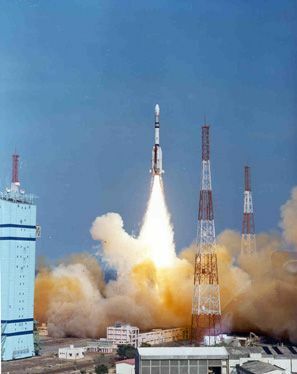 The Indian Space Research Organization launches the INSAT-4CR communications satellite atop a Geosynchronous Launch Vehicle (GSLV) booster on Sept. 2, 2007 from Satish Dhawan Space Center on Sriharikota Island. Itwas a day of redemption for India's space program Sunday, when the nation'smost powerful rocket returned to the skies for the first time since a boosterengine failure doomed a launch last year. The GeosynchronousSatellite Launch Vehicle, making its fifth flight since debuting in 2001, blastedaway from the Satish Dhawan Space Center on Sriharikota Island. Liftoff was at 1250 GMT (8:50 a.m. EDT), the exact time of sunset on India's east coast. The 161-foot-tall rocketflew east over the Bay of Bengal on track to deposit the INSAT 4CRcommunications satellite into orbit. The liftoff was delayed twohours due to a last-second technical problem that halted the countdown momentsbefore launch. The GSLV's cryogenic upperstage successfully deployed INSAT 4CR about 17 minutes after liftoff. INSAT 4CR was released intoan elliptical transfer orbit stretching from a low point of about 104 miles toa high point of 21,568 miles. The orbit's inclination was 20.7 degrees,according to the Indian Space Research Organization. The apogee mark was 786miles lower than pre-launch predictions, and the achieved inclination was onedegree off the target of 21.7 degrees. Despite the rocket'sunderperformance, Indian space officials declared the critical mission asuccess. They offered no explanation of the slightly low orbit. ISRO officials alsoconfirmed the payload unfurled its two solar panels a few minutes afterspacecraft separation. The power-generating arrays stretch about 31 feet fromtip to tip. The three-stage rocket'slast flight endedin disaster about one minute into another communications satellite deliverymission in July 2006. A committee appointed to analyze the failure determined apropellant regulator inside one of four liquid-fueled strap-on boostersmalfunctioned, which allowed excess propellant to flow into the Vikas engine. "The reason for thiscould be an inadvertent error in manufacturing, which escaped the subsequentinspection and acceptance test procedures," ISRO said in a statement. The investigation boardrecommended revamped fabrication and acceptance guidelines, and ISROimplemented the improved procedures, according to a spokesman. ? Pressures and temperaturesinside the engine soared above operational limits, which led to the powerplant's premature shutdown just moments after liftoff. The rocket's steeringsystems performed well until the launcher neared the speed of sound, and theGSLV veered out of control and broke apart about 55 seconds after liftoff. The four strap-on enginesburn hydrazine and nitrogen tetroxide during the first two-and-a-half minutesof launch. The boosters are clustered around a solid-fueled core stage. INSAT 4CR was ordered as areplacement for INSAT 4C, which was lost in last year's launch accident. The 4,696-poundsatellite will raise its altitude and reduce its inclination in the nextfew weeks before parking itself in geostationary orbit 22,300 miles above the Indian Ocean. Expected to operate for atleast ten years, INSAT 4CR will specialize in direct-to-home televisionbroadcasting, video picture transmission and digital satellite news gatheringservices. INSAT 4CR carries 12 Ku-band transponders that will reach across India. INSAT 4CR is the 11th memberof the INSAT fleet in service today. The INSAT series includes bothcommunications and weather satellites. India's next launch could be less thanthree weeks away, according to local media reports. Workers at Sriharikota arebusy preparing a Polar Satellite Launch Vehicle for launch later this monthwith an Israeli spy satellite called Polaris. The covert spacecraft will be thefirst Israeli satellite fitted with a cloud-piercing radar instrument, whichcan see objects on the ground through darkness and inclement weather. Testing is also continuingon a new third stage engine for future GSLV launches. The GSLV currently uses aRussian-supplied cryogenic engine, but Indian engineers are working on anindigenous system for use on upcoming flights. Engineers completed aneight-minute test firing of the new engine last month. The engine, which burnsliquid hydrogen and liquid oxygen, will fire for about 12 minutes during a reallaunch. An ISRO spokesman told SpaceflightNow the first flight of the new engine is scheduled for next March or April.